Like most dentists, Tad Morgan, DDS, and his Bullard, TX dental team are focused on preventing oral health concerns. When tooth decay and dental damage does occur, Dr. Morgan and his team are here to help you repair your smile with a variety restorative dentistry options. Dedicated to conservative treatment, we always recommend restoration options that fully repair dental damage while strengthening remaining tooth structures to avoid additional damage or wear. Crowns and bridges are two of the most frequently used restoration options available in most dental offices. If you want to find out more about dental crowns, fixed bridges, or any of our restorative dentistry services, call to schedule an appointment in our Bullard dental office today. We look forward to seeing you soon. A dental crown is a restoration that we place over the top of a damaged tooth to recreate the damaged portions of teeth and protect the remaining dental structures from additional damage. 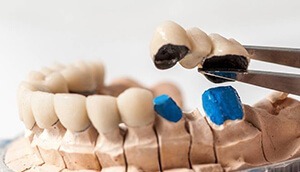 Crowns can be crafted from a variety of materials, but in most cases, we recommend using quality ceramic dental crowns due to their close-to-natural appearance. A fixed bridge is a restoration prosthetic used to replace one or a few consecutive teeth. The replacement tooth or teeth, called pontics, are fused together in a row. Then, dental crowns are placed at both ends of the prosthetic. The dental crowns are attached to healthy teeth on either side of the gap in your teeth, seamlessly recreating the flawless smile. Dental crowns and fixed bridge restoration plans both require two treatment visits in our Bullard dental office. The initial visit is the preparatory and treatment planning appointment. We begin by removing any damaged tooth structure. Then, a small amount of enamel is removed around the outside of the tooth. This makes it possible for the crown to fit over the tooth without creating crowding or changing the shape of the smile. 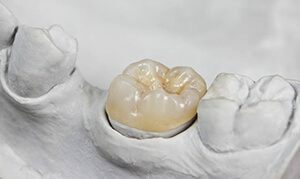 Once teeth are prepared, we capture impressions that are used to design and craft your dental crown or bridge. Next, we place a temporary restoration to protect prepared teeth between appointments. Once we receive the final crown or bridge from our dental lab, you’ll return to our office for the second treatment visit. This appointment is much shorter. We’ll simply remove the temporary. Then, we place the flawless, custom dental crown or bridge.